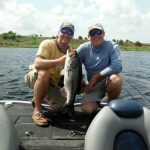 Today I was working for Capt Mike Shellon out of Okeechobee Fishing Headquarters, pretty windy day but water temp high was 75 degrees. It was pretty good, we caught 15 or so but had to work for it. Big fish for the day was a 7lbs bass.